Sarla for taking everything over herself. Sarla blames herself. Preeta now calms Sarla down for taking a lot of care for Janki. Prithvi comes to Sherlin excited about Janki’s memory loss. Sherlin was also cheerful. They were caught by Bee ji. Prithvi says they were discussing Janki is awake and it seems a burden was taken down their shoulders. Bee ji wonders when did Prithvi and Sherlin became such good friends. The doctor arrives them. Outside the house, Karan asks Rishab why he brought him outside. Rishab asks Karan if he attempted to break Preeta’s relation. He knows well Karan lied to Preeta’s family and gathered them in hotel. Karan says everyone insists Preeta is important for him as well, why would he hurt him or his family. Karan says he saw Prithvi with another girl there, but at the last moment he called Preeta there. Rishab says Prithvi is a very cunning man; but Karan must not interfere in Preeta’s life anymore. Karan says he can’t let Preeta marry Prithvi at any cost. Rishab promise he will handle the matter, and doesn’t want any more discussion about this matter. Preeta comes out and hear they were discussing about him. Karan denies, as she gives herself more self-importance. Rishab also denies talking about her. Preeta smiles that what she likes the most about Rishab is his honestly and truthfulness. Rishab was lost about what else she had said there. She asks them not to argue for her. Karan jokes but Rishab tells Preeta they were talking about Prithvi. Karan was sure she won’t understand. Rishab says he doesn’t trust Prithvi to be true, he asked his manager to find about his past. Preeta tells Rishab this is pointless suspicion. They had a roka and she has accepted him as her fiancé. Karan asks if her own life doesn’t matter to her. Preeta requests Rishab to stop this investigation about Prithvi, her family trusts him. Rishab takes her promise that she would share if there is any problem in her life with Prithvi. The doctor assures the family that Janki is completely fine. It will take her some time to recall everything. It’s because of damage of her brain cells due to head injury. The clot will soon dissolve, they must stay with her and recall her everything. Sherlin thinks she wouldn’t let this woman’s memory return. Prithvi furiously stares at Sherlin. Sherlin wonders why Prithvi is angry at her now. Outside, Rishab talks to someone on phone. Karan was staring at him and asks if he would cease his investigations against Prithvi. He says Prithvi is a faulty man with a huge doubt. 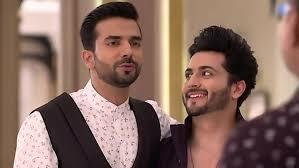 Rishab tells Karan he would not stop his investigation against Prithvi. Preeta is a very simple girl but he doesn’t trust Prithvi at all. But he will do it calmly. Actually Karan doesn’t do anything calmly and creates a drama of each matter. Karan thinks if Prithvi already has a girlfriend, why he wants to marry Preeta. Sherlin hears Rishab say he must first find out who exactly is Preeta. Sherlin thinks they are gathered around by enemies, but till good luck is there with them no one can ruin their planning. water. She forbids everyone to pressurize Janki. Janki caress the faces of Preeta and Shrishti and asks Sarla if they are really her daughters, they are so pretty. They all laugh. Sherlin asks Prithvi why he is behind that Karan. Karan and Rishab have team up and want to find out why he wants to marry Preeta. They are suspicious about his intention; they have been trapped now. If Karan finds out they know each other from the past, he will at once get to know their intentions. She urges him to think about something. Prithvi was furious, he tells Sherlin to leave this place right away as he may do anything while angry.